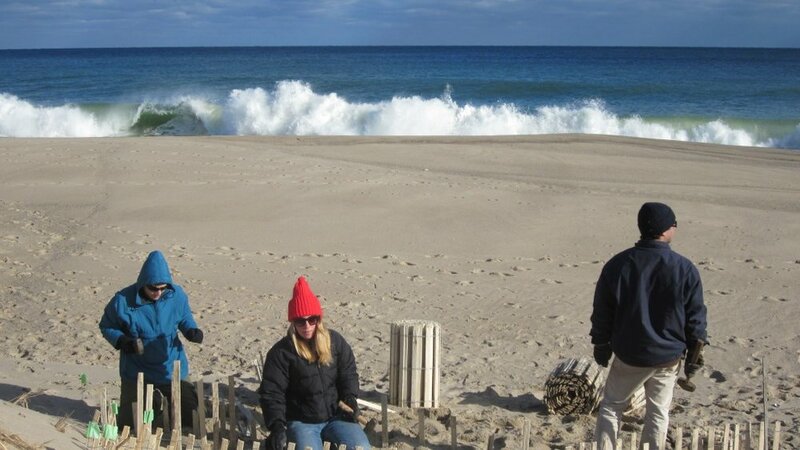 The image above, shows a completed coastal dune restoration on the Ocean Beach in Truro MA. Our successful biomimicry sand collection system was developed on this project, through analyzing five failures of experimental collection systems at the over washed toe of the dune. I explain to people that coastal restoration is sort of like baking bread: you need to understand the ingredients; put them together in the oven; and get out of the way. 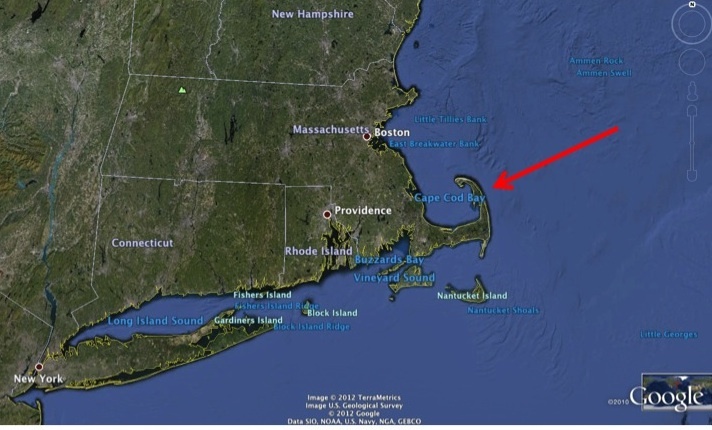 In this case, our "oven" is the North Atlantic Coast of Cape Cod. This passive strategy stabilizes eroded areas while collecting new sand, often raising elevations as much as ten feet a year. Damaged barrier dune systems are tricky to read and nearly impossible to restore back to sustainability. Barrier dune over wash is a natural component of the coastal process for sandy shores. These events might take place on a multi decadal time line. When barrier dunes experience anthropogenic destruction of stabilizing vegetation, the geomass is unprotected from ocean storms and over wash may occur every other year. Barrier dunes are considered a critical coastal resource in Massachusetts because they protect inland resource systems from ocean storms. 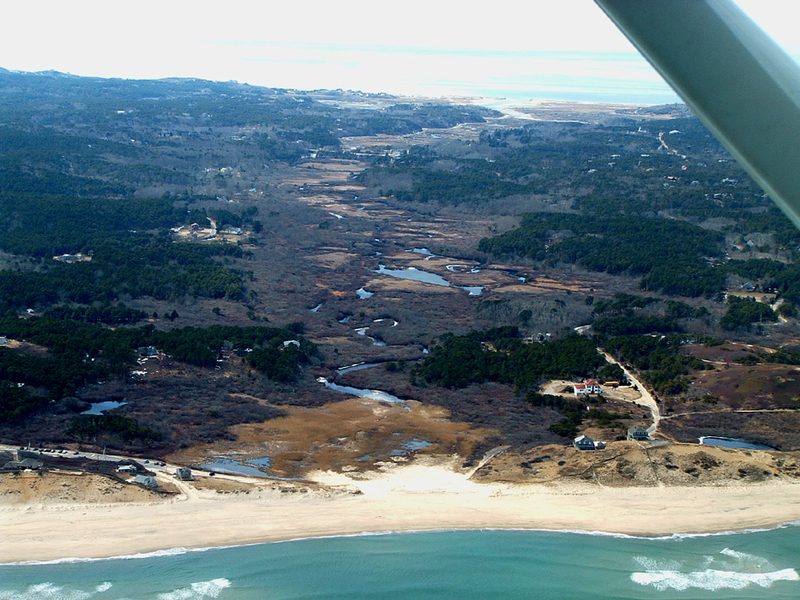 In this case study, the barrier dune protected a fresh water marsh at the headwaters of the only functioning river system on the Outer Cape. The down stream part of this river empties into a tidal estuary, containing legendary sport fishing and shellfishing resources. In a healthy barrier dune systems, vegetation interacts with wind energy to collect and stabilize wind blown sand. In this system, vegetation was removed and storm winds quickly removed unprotected sand. Within a few years, ocean waves gained access to the marsh. The salt water quickly degraded the ecological performance of marsh vegetation, which transitioned to invasive phragmites monoculture.This page shares a "walk through" of our thought process, our strategy and the development of unique innovations in technique that produced what has been referred to as "unbelievable" results for barrier dune restoration. Image below: Barrier dune destruction following 1991 "Perfect Storm", when eroded pedestrian pathways allowed ocean storm waves through the dune and into the fresh water marsh. Image below: While attempts at restoration were made, none proved sustainable and over wash events continued every few years for 19 years. The unusual image below shares the reason we committed to this environmental intervention. 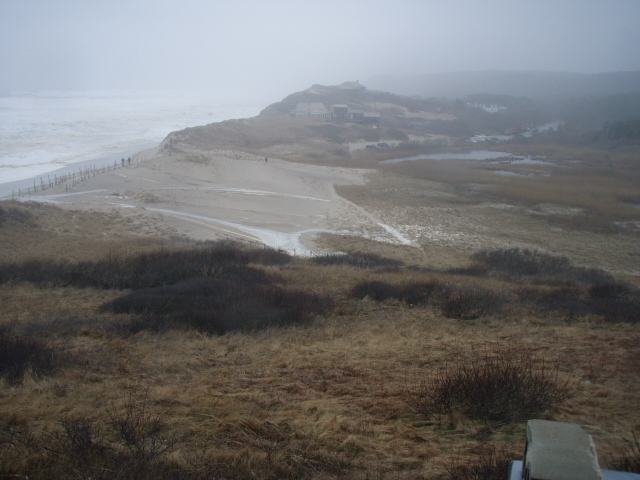 During the winter of 2008-09, another ocean storm event had washed over the eroded barrier dune and into the fresh water marsh. When I visited the marsh that spring (2009), I could only find one pair of nesting ducks...I remember watching in puzzled fascination as they began walking out of the marsh together and into the parking area...very strange behavior. I can still remember the emotion I felt when I realized they had come to the parking lot to drink rain water...because the marsh was too contaminated. That summer we created our restoration proposal. It languished under "informal regulatory review", with no feedback, for a year. In the fall of 2010, we approached the Town of Truro Conservation Commission, created a Community Restoration Partnership and "things" began to move forward. Considering a resource area as a "Resource System" helps us understand interactive, internal linkages, such as marsh water and vegetation linking insects, fish and birds. We also know that resource systems are linked to other resource systems, which helps us understand how the health of one system is interactively linked to the health of other systems. In this case, the health of the barrier dune was linked to the health of the fresh water marsh behind it and the marsh was linked to the health of the connecting river and estuary. Coastal restoration efforts are more successful when we include these external linkages. Referred to as "linkage to scale", this is a core value of sustainable resource systems. In this case we needed to link the existing geomass profiles on each side of the breach, to the restored area, by particle size, particle mix and profile. We identified the natural and anthropogenic energy moving through this resource system: wind and people. These were the energies which interacted to degrade the performance of this barrier dune. We used a process referred to as "Double Loop Learning" to study this degraded resource system. "Single Loop Learning" identifies a problem but DLL identifies the cause of the problem. In this case, anthropogenic activity of beach goers actually caused the problem through destruction of beach grass, setting the stage for massive, ocean storm erosion. Since an alternatives analysis would be created for this project, we knew prohibition of pedestrian activity would be an alternative. In house, we determined up front, that pedestrian access must remain a component of restoration. Not simply because we needed to incorporate causal energy but we knew inclusion generates stewardship. We believe there is benefit in creating Community Restoration Partnerships. In this coastal resource area, there were multiple local, State and Federal interests. Partnerships are a useful tool to integrate communities and the jurisdictional matrix. The important goal to remember when sometimes conflicting priorities are brought to the table is to focus on the common goal Partnerships contribute to environmental, social and sometimes financial support, the core values of sustainable, environmental economics. Image below: Overview of Pamet River, on Outer Cape Cod, following the 1991 "Perfect Storm". The ocean is in the foreground (also note the exacerbating erosion component: lack of protective sand bars offshore) and the bayside estuary is at the top. Overwash fan of sand marks where ocean storm energy translocated barrier dune geomass into the fresh water marsh. After multiple, similar events, marsh habitat became consistently degraded with invasive phragmites reeds. To restore this resource system, we would need to incorporate the two energy forms responsible for it's destruction: Wind and anthropogenic. Two energy sources, exhibiting non linear relationships with each other, would need to be part of the solution. But first we needed to describe what we were proposing and document the existing conditions. We decided to hire a geology grad student, at our own cost, to properly document geomass status and recent geological history on the eroded site. This effort produced a 14 page report titled "Unintended Consequences of Public Access" BALLSTON PROPOSAL .How much sand was missing? Our conservative calculations determined approximately 600 cubic yards of barrier dune were missing. One of the strategies we needed to consider was the traditional response: bring in that much sand using local contractors...equipment in sensitive areas...sand not exactly compatible in particle size and mix...the permitting that would be triggered alone could cost well over a thousand dollars. The sand and delivery would go maybe eleven to twelve thousand dollars. Purchase and planting beach grass would go another three plus thousand dollars. Then there would still need to be layers of fencing. $20,000 to protect the headwaters of a river systemfrom continued salt water over wash. $20,000 to protect a river system containing critical shellfish and sport fishing habitat seems cheap, unless you are a cash strapped coastal community. 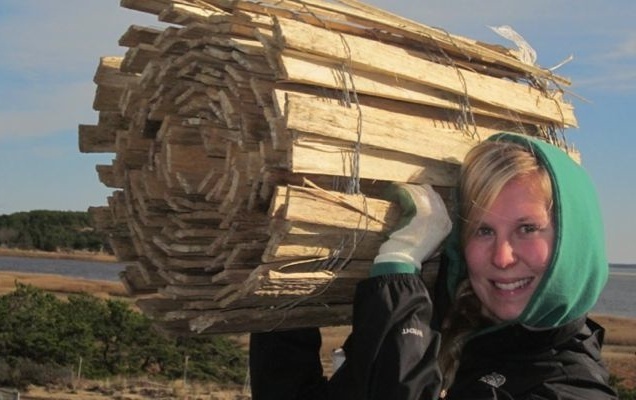 Then the idea of supporting an innovative restoration proposal, using a technique with a limited history of performance, volunteer labor and donated materials seems worth thinking about. Image below: Facing through eroded dune towards marsh, shows portion of overall eroded area. Significant differences in elevation existed. 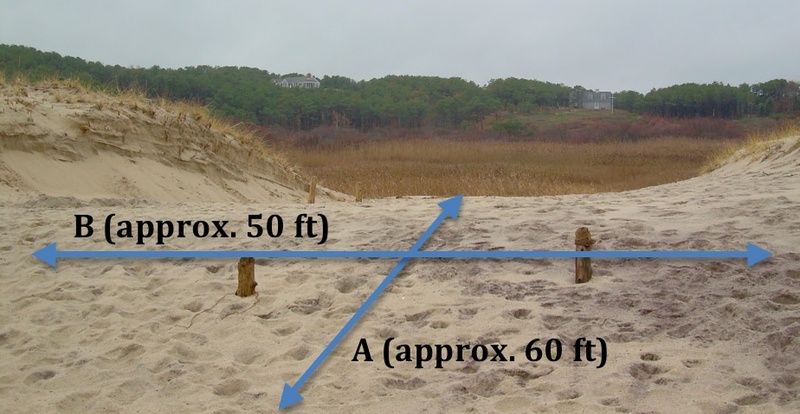 Image below: Jaclyn set up a measurement grid spaced at eight foot intervals, beginning on the marsh side of the eroded area and moving towards the ocean side of the dune. Along each grid line, we took elevation measurements across the eroded area (from left to right in the photo above). Image below: We used a half pipe model, set up by one of our Interns who happened to be an Environmental Engineering student at Syracuse University, to get a sense of how the area had eroded and where the weakest spots were. These are models from our measurements and may not depict the true elevation differentials. We included the image of this "Wind Rose" as a study of local wind recordings for the year. 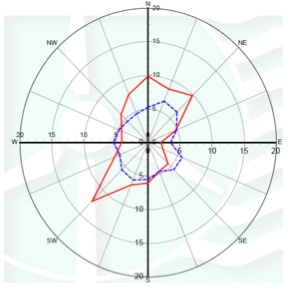 Red line shows percentage of time wind blew from a direction and blue line denotes mean wind speed. The wind took this barrier dune apart and we would be asking this same wind to help us put it back together. Safe Harbor had previously developed an innovative, small scale restoration model, using 24 inch sand fence to stabilize replacement sand on a small Bayside Town Landing. We also developed a zig zag pedestrian access for the same area so the public could have access to the beach during restoration. We noted with some interest how the short fencing also collected new sand during storms. This passive strategy stabilized eroded areas while collecting new sand, often raising elevations several feet a year. We selected short fencing for our proposal, for it's newly discovered sand collection abilities. It had managed to collect two feet a year on the Bayside so we figured the oceanside barrier dune restoration as a five year project. The fencing system is quickly installed, using a rubber mallet to tap each slat into the sand. No excavation or posts are required. 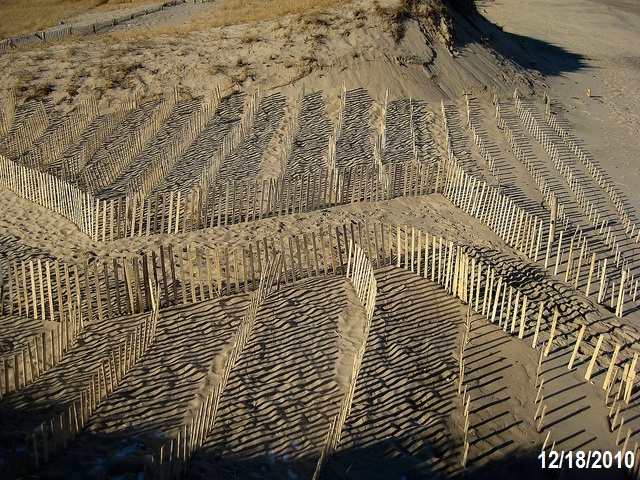 New layers of fencing can be placed to create a form compatible with adjacent dune profiles. 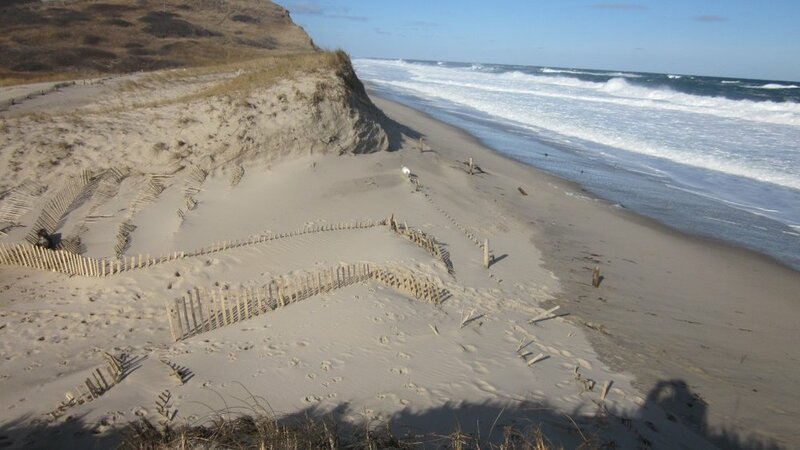 The short fence collection system had never been used solely for collection and it had never been used before on the ocean.We proposed to fill the breach area with lines of short fences spaced 3 feet apart where we wanted to create a fore dune and five feet apart in the back dune area. We knew sand would collect behind each line of fencing except for one detail, the ocean was right at the front door.We would have to expect failures and we would have to learn from them. In House, we prioritized minimalization of our system. By reducing impact through lowering profiles, we were seeking the unknown edge between minimal structure and maximum results.This site had 19 years of failed attempts, mostly driven by large, physical systems.In retrospect, writing now, this single priority eventually drove the development of an astounding system we will describe later on. We explored permitting alternatives in this area and ended up getting permission to work under a pre-existing maintenance permit for previous restoration attempts. Though we would be working under an existing permit, the innovative nature of using half height and fence, no posts AND allowing public access, created some amount of discussion with the Beach Commission, Conservation Commission and Department of Public Works. A lot of discussion focused on a preference for prohibition of public access. Since this project would only move forward with full support, we needed to be respectful of differing opinions. Restricting access is understandable but would generate polarity within the community and was not compatible if the system were to become sustainable. Multi use coastal resource areas simply require planned access. Integrating public accesswith restoration focused on a simple yet critical principle: "Absolutely no perpendicular access". Pedestrians intuitively create perpendicular across directly across dunes. This pattern of use removes vegetation holding sand. Let's remember that dunes don't randomly exist, they are actually created by prevailing winds. Unprotected sand blows away, creating what we refer to as a "shotgun" blow out, straight across the dune. Eventually this blow out will be used by waves. How serious is this...think... over 600 cubic yards of sand missing from this project site. We use zig zag patterns to provide access and minimize erosion. Areas adjacent to the path collect sand and the path benefits from spill over, elevating along with the restoration. Instead of being prohibitive, our signage reads "thank you for using pathways". Image below illustrates principle of sand collection fencing. Previously, only four foot high fencing with installed posts had been used. What would happen when we explored minimizing this concept? Image below: The Breached Barrier Dune. Would we be able to gain public support for zig zag paths? Was there really a possibility that we could use the same ocean storm winds that had destroyed this dune to put it back together? Did we miss something in our thought process? Image below documents major anxiety moment for Safe Harbor Director Gordon Peabody, standing in the breach of the barrier dune. Within 24 hours of this photo being taken, on December 8, 2010 he would be attempting a large scale, Barrier Dune restoration, using an innovative system previously only tested on a very small scale. How would this very low profile system survive? The system could totally fail during the next storm. Or would our new technique be able to actually use storm wind energy to generate restoration? Image below: 24 inch high sand fencing had been successful in stabilizing and collecting sand on small scale, Bayside restoration projects. Image below: Safe harbor Director Gordon Peabody demonstrates technique for obtaining 24 inch sand fence from rolls of 48 inch sand fencing. This fence is also known as "snow fencing"
Image below: The 24 inch fencing is set in rows using a rubber mallet. Where we hoped to recreate the face of the dune, rows were set 3 feet apart. Image below: We were reminded every minute that this new system would be tested by the ocean. Image below: This is an important image, taken the second week of December 2010, illustrating integration of 24 inch collection fencing with zig zagged pedestrian access pathway. Once the system was in place we waited for a storm. We didn't have to wait long. The following week brought a terrific, 3 day ocean storm. After the storm had passed, We received phone calls: "the fencing is gone, your system didn't work". I carefully instructed our workers not to go to the site because if the system hadn't worked, I needed to prepare myself to take full responsibility for the failure. By the end of the next week, I had prepared myself to visit the site. Image below: Restoration site following the first ocean storm. We had received reports that our fencing was "gone", an upsetting thought. I finally made time to visit the site myself. As I walked up the pathway I had to agree the fencing appeared to be gone...but then I noticed the fencing only seemed to be gone, because it was actually buried beneath two feet of collected sand...which confirmed that our system had worked. As I looked over this incredible success, I realized it was Christmas Eve. Image below: We added a second layer of fencing. That layer filled up with sand in the next storm but we experienced an over wash event which caused the fencing closest to the beach to fail. Image below: At the surf line we experienced serious failures with the wired slat fencing. We determined they had too much structure to continue using them. We decided to experiment with minimizing the surf line system. Image below: (photo is mis-dated) We experimented with minimizing the surf line fencing by using shorter slats and removing every other slat. The remaining slats were still connected by the two original lines of wire. 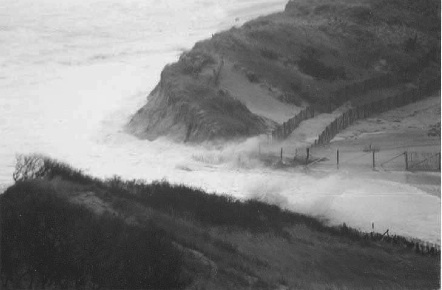 Image below: (Photo mis dated) The surf line fencing worked but was prone to over wash failure. Seaweed captured by the wires was adding structure by default. Image below: We continued working towards further minimization by cutting the wires every three feet. 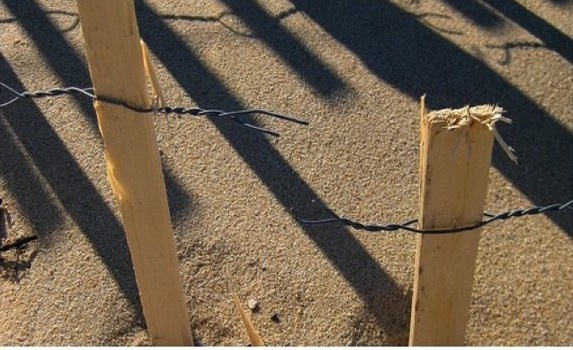 Image below: We extended the technique of cutting the wired fencing into sections, to the 24" sand collection fence. During over wash events, this enabled six foot sections of fencing, to roll up without being destroyed. Image below: Following an 80 mph winter blizzard, we determined that our structural minimization of surf line fencing was still failing. How could we minimize any more? Image below: When we were removing the failed surf line fencing, slats began falling out and we decided to experiment, using just slats with no wires. 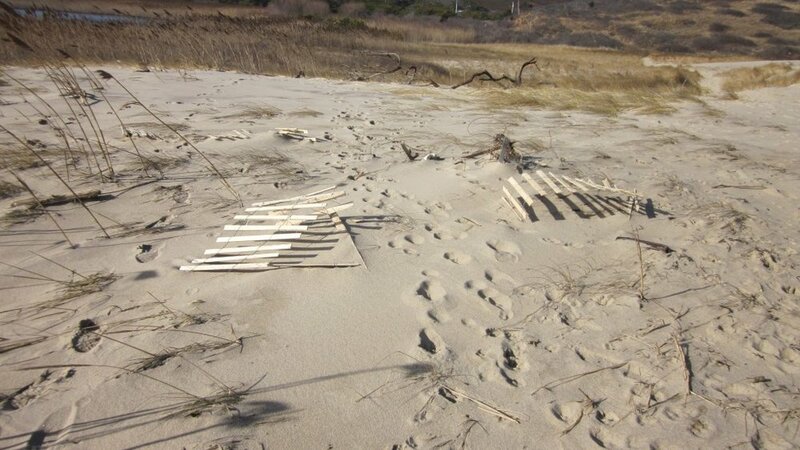 Image below: We randomly inserted the single slats into the sand, spacing them 8-10 inches apart, along the area where the failed surf line fencing had been, over a ten foot width. Image below: We were stunned at the results of this random experiment, which used components from our triple failed surf line system. Image below: We realized this never before used system was successful because it was mimicking the subtle yet effective performance of native vegetation to collect sand. Our continued priority of minimization had led us to biomimicry a technique so successful that it began collecting sand from the wind and wave over wash. 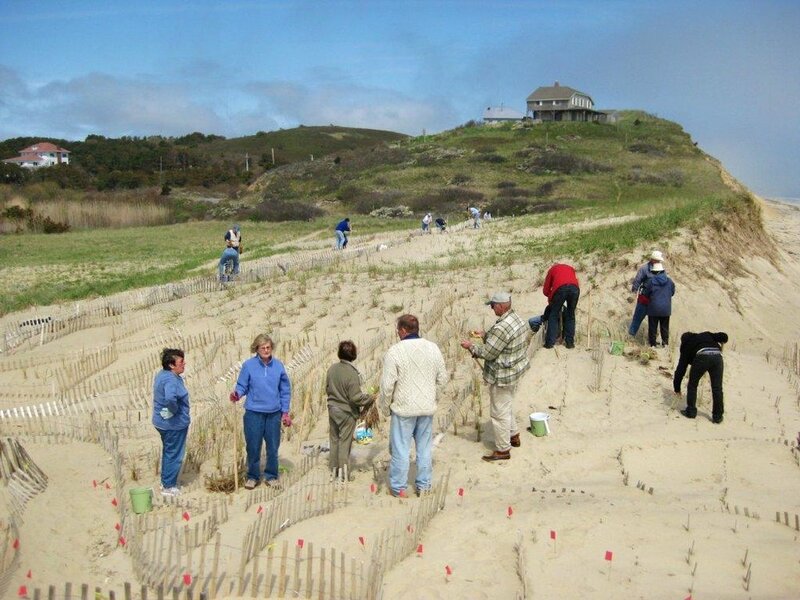 Image below: once we had restored enough geomass profile to thwart over wash, we set up community beach grass planting events to begin the transition to a sustainable system. Image below: When the 24" wired fencing got buried from collected sand, we would install another set of 24" fencing on top of it. With the single slat fencing, another idea came to mind...why not just pull up each slat, so it could keep on collecting sand? Image below: With so many slats to adjust, we set up a program to use student volunteers. We gave each group a presentation on our project and taught them how to safely move on the newly collected sand. This group is from the Four Rivers Charter School in Greenfield, MA. One of our workers came in from working on the restoration site and asked me "what the heck is going on out there?" "Where is so much sand coming from and how did we get so much?" Some elevations had increased by twelve feet in a period of 14 months. Conclusion: The bottom line and I am told we should have one here, might be that when you are attempting a coastal restoration effort, be prepared to fail. If you fail, be prepared to learn from your failures and improve on them. Be prepared for results that may vary, though in this case the sand collected faster than we could keep track of. Finally, we work at the edge of the Earth, in God's country...remember to listen. Gordon Peabody, Wellfleet MA, August 2012. Post Script: With the restored barrier dune protecting the fresh water marsh again, water quality and ecosystem diversity began improving. As a post script, Safe Harbor was awarded a grant to cover part of the unexpectedly intense labor demands, from SPAT, the Wellfleet shellfish educational organization responsible for the annual Oysterfest.